RED DEER - Team Alberta U16 Male opened up round-robin play at the 2019 Canada Winter Games with a 4-3 overtime loss to Saskatchewan Saturday night. Alberta never trailed at any point, and held a lead for much of the game, but Saskatchewan wouldn’t go away. Kai Uchacz opened the scoring for Alberta early in the first, but Saskatchewan countered just two minutes later on the powerplay. Dylan Guenther’s powerplay marker gave Alberta the lead heading into the second period, where Saskatchewan tied the game again. Zack Stringer’s late second period goal gave Alberta the lead once more, but Saskatchewan tied the game yet again halfway through the third, before Nolan Allan sealed the victory for his team. Goaltender Drew Sim made 18 saves for Alberta, while his counterpart Brent Mirwald stood tall to earn the win for Saskatchewan, stopping 40 of the 43 shots he faces. Team Alberta is right back at it again Sunday afternoon against Manitoba at 4:00pm at the Centrium. The game will be shown on TSN at 5:00pm. RED DEER - It was another banner year for Alberta’s collegiate athletes as Canada West announced its year-end honours on Wednesday. Seven Albertans - three in Men’s Hockey and four in Women’s Hockey, were recognized for their outstanding seasons. Canmore’s Luke Philp (University of Alberta) repeated as the Canada West Player of the Year, while Edmonton’s Grayson Pawlenchuk (University of Alberta) was named the Rookie of the Year. Sherwood Park native Riley Kieser (University of Alberta) was honoured with the Student-Athlete Community Service Award. Both Philp and Pawlenchuk are Team Alberta alumni, with Philp winning bronze with Alberta at the 2011 Canada Winter Games. It was a clean-sweep for Albertans in Women’s Hockey, with all four awards going to Team Alberta alumni. Edmonton native Alex Poznikoff (University of Alberta) earned top honours as the Canada West Player of the Year, Okotoks’ Breanne Trotter (Mount Royal University) was named the Rookie of the Year, and the Student Athlete Community Service Award went to Anna Purschke (Mount Royal University) of Sherwood Park. Former Team Alberta Coach Howie Draper (University of Alberta) was named Coach of the Year. Poznikoff won a bronze medal with Team Alberta at the 2013 National Women’s U18 Championship, and again at the 2015 Canada Winter Games. Draper coached the bronze-medal winning 2015 team, and also led Team Alberta to gold at the 2011 Canada Winter Games. RED DEER - Team Alberta U18 Female completed their round-robin play at the 2019 Canada Winter Games with a 2-1 loss against Ontario on Tuesday night. In a scoreless first period, Ontario led in shots on goal 10-6. The first goal would not be notched until nearly midway through the second frame, when Ontario put home a rebound to make it 1-0. They would take that lead into the third period. Team Ontario would take a 2-0 lead with 12:41 to go in the third period. Alberta made a push near the end when Teghan Inglis scored on the power play with 1:27 remaining to make it 2-1. That goal was as close as Alberta would get, as Ontario held on for the 2-1 victory. In her second start of the tournament, Bella McKee held down the fort for Alberta, stopping 36 of the 38 shots she faced. Ontario netminder Kayle Osborne made 20 saves for the win. Team Alberta finished third in Pool B and will now play Manitoba in the quarterfinals on Thursday at 4pm at the Downtown Arena. RED DEER - Team Alberta U18 Female continued their round-robin play at the 2019 Canada Winter Games with a 4-3 Shootout win against Team Nova Scotia on Monday evening. Alberta had most of the pressure in the first period, but it was Nova Scotia who would get on the board first just 3:29 in. Aliya Jomha would respond for Alberta midway through the frame with a tip-in front of the net. Nova Scotia would score the only goal in the second frame in what was an even period with shots finishing 9-9. Team Alberta would tie the game at 2-2 four minutes into the third on a goal by Sarah Wozniewicz, but Nova Scotia would take the lead once again with eight minutes to go. Just 1:03 later, Danielle Serdachny would put one home on the power play to once again tie the game. The game remained tied through regulation, and the two teams headed to overtime. A late penalty in the third period set Nova Scotia up with a 4 on 3 power play to start overtime. Alberta would kill that penalty off, and ultimately neither team would end the game in OT. The shootout featured six shooters for each side, with Kassy Betinol scoring once and Stephanie Markowski scoring twice, including the winner for Team Alberta. Caroline Gosling got the start for Alberta and stopped 20 of 23 shots, including six saves in overtime. Team Alberta finishes round robin play on Tuesday night against Ontario at 730pm at the Centrium. Ontario is coming off a is coming off a 5-1 loss to BC on Sunday afternoon, and is currently ahead of Alberta by one point in Pool B. RED DEER - Team Alberta U18 Female opened up round-robin play at the 2019 Canada Winter Games with a 6-1 loss to Team BC on Sunday night. Alberta put the pressure on BC in the first period, out-shooting them 8-2, but BC scored a late-period goal to take a 1-0 lead into the second frame. Kassy Betinol tied the game just two minutes into the second, but BC took the lead again just 30 seconds later, and would add four more goals for the 6-1 win. Bella McKee got the start for Team Alberta, allowing six goals on 15 shots. Caroline Gosling came into the game halfway through the third period, stopping all three shots she faced. Team Alberta is gets back at it again Monday night against Nova Scotia at 730pm at the Centrium. The game will be shown on TSN3. Nova Scotia is coming off a 5-1 loss to Ontario on Sunday afternoon. RED DEER - The Canada Winter Games attract volunteers and spectators from all walks of life, but for one volunteer, the 2019 Canada Winter Games in Red Deer are particularly special. 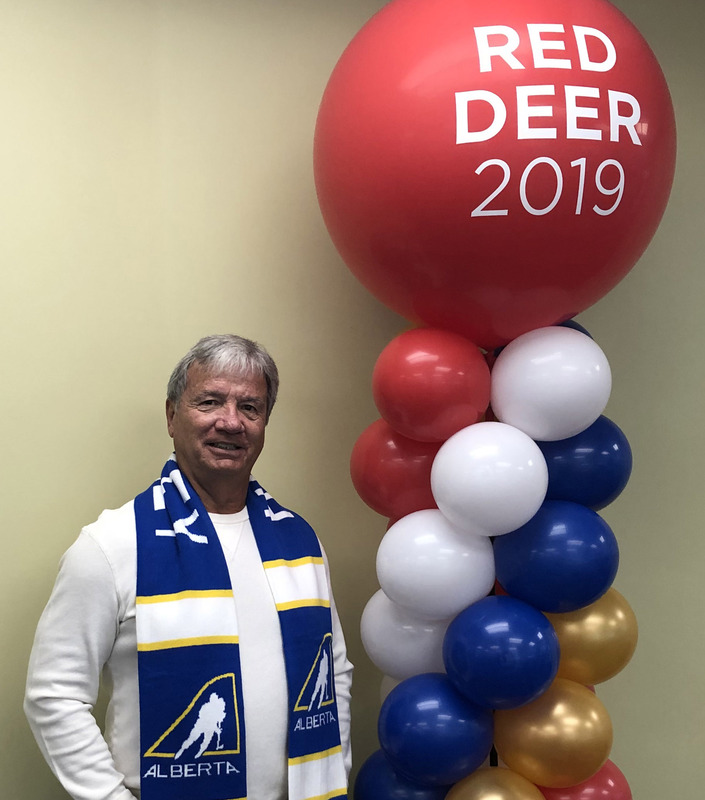 Billings, a Red Deer native, was back in his hometown during the winter months for the first time in nearly ten years, as he and his wife both volunteered for the 2019 games. According to Billings, it was important for him to take part in the Canada Winter Games in his hometown, as he was part of the inaugural games in 1967. In fact, Billings was a member of the gold medal-winning University of Alberta Golden Bears, who represented Alberta at the games. "It makes me feel old, for one thing," said Billings on volunteering for the Canada Winter Games 52 years after winning gold. "I’m glad to still be here to enjoy it, and it probably means more to me now than when it happened, because I understand things a little better, you know, you cherish things more. I’m excited for all the young kids too, I’m looking forward to seeing it and being a part of it again." Billings said as time passed by, he gained a greater appreciation for the one-in-a-lifetime experience in 1967. "I didn’t really understand it all back then, I was just 19 years old, and in my first year of University," he said. "It was just exciting to be part of it. We played in the Quebec Coliseum, the building that Jean Beliveau built, that’s exciting. You walk in there, and you look up and see all these guys and say ’wow, I can’t believe I’m here’. Then we finally won, and that was hard to accept, we sat there and thought ’wow, did we really do this’? Then it hits home after awhile, and just like anything that you win, it was surreal." Billings had the honour of representing the historic 1967 Men’s Hockey team at the 2019 Canada Winter Games Opening Ceremonies as well, as was selected as one of the final torch-bearers. Although 52 years have passed, Billings said he still carries fond memories of the 1967 Canada Winter Games, and is looking forward to make new memories in 2019. RED DEER - Hockey Alberta is pleased to announce the leadership group for Team Alberta’s U18 Female team for the 2019 Canada Winter Games. Danielle Serdachny (Edmonton) will captain Team Alberta, with Kassy Betinol (Okotoks), Teghan Inglis (Okotoks) and Isabelle Lajoie (St. Albert) serving as Assistant Captains. Team Alberta kicks off play round-robin play against Team BC on Sunday at 7:30pm, with games against Nova Scotia and Ontario set for Monday and Tuesday at 7:30pm, respectively. All games are at the Centrium at Westerner Park. RED DEER - Team Alberta rebounded from an 8-4 semi-final loss with a 12-0 win over Saskatchewan Friday night to claim the bronze medal in Men’s Hockey at the 2019 Canada Winter Games. In the second matchup of the tournament between the two teams, Alberta avenged a 4-3 overtime loss to Saskatchewan on Saturday. Matt Savoie opened the scoring for Alberta late in the first period, and added two more to open the second period for a natural hat-trick. Savoie also had two assists for a five-point game, and finished the Canada Winter games with 13 points. Alberta saw six more tallies in the second as part of an eight-goal period, and three more in the third. Craig Armstrong (2), Dylan Guenther (2), Tyson Laventure, Zack Stringer, Olen Zellweger, Owen MacNeil and Marc Lajoie all scored goals for Alberta in the win. Guenther added three assists to also finish the tournament with 13 points, tied for the team lead with Savoie. Alberta goaltender Drew Sim stopped all 37 shots he faced to earn the shutout win. The Canada Winter Games take a one-day break on Saturday before re-starting for Week Two on Sunday, when Team Alberta U18 Female kicks off their quest for gold at 7:30pm at the Centrium. RED DEER - Despite a strong third period comeback attempt, Team Alberta dropped an 8-4 decision to Ontario Thursday night in the Canada Winter Games semi-final. Ontario opened the scoring just 1:21 into the game, and would score another with 1:40 remaining in the first to take a 2-0 lead into the second period, where they would score four more to take a 6-0 lead after two. Alberta came out hard in the third period, with four goals in a span of eight minutes from Zack Ostapchuk, Colton Dach, Matt Savoie and Tyson Laventure to make it a 6-4 game. But, Ontario halted Alberta’s charge with a powerplay goal and a shorthanded goal to make it 8-4, punching their ticket to the gold medal game against Quebec, who beat Saskatchewan 7-3 in the other semifinal matchup earlier in the day. Drew Sim got the nod for Team Alberta, and made 18 saves on 26 shots to take the loss. Alberta heavily outshot Ontario, but Benjamin Gaudreau held down the fort for his team, stopping 40 of 44 to earn the win. Alberta still has a shot at the podium as they draw up against Saskatchewan in the bronze medal game at 4pm on Friday at the Centrium. The live stream of the game can be found here. RED DEER - Team Alberta punched its ticket to the semi-finals at the 2019 Canada Winter Games with an 8-3 win over New Brunswick on Wednesday night. Alberta wasted no time in getting on the board, with Tyson Laventure opening the scoring just over three minutes into the game, but New Brunswick countered just over a minute later. Dylan Guenther regained Alberta’s lead just two minutes after that, only to have New Brunswick tie it up again 16 seconds later. Team Alberta took the lead for good following goals from Matt Savoie and Zack Ostapchuk. New Brunswick added another goal late in the first period, but Alberta shut the door from there, and would add to their lead with second period goals from Laventure, Brett Hyland, Craig Armstrong and Savoie. Lochlan Gordon got the start for Alberta, but gave way to Drew Sim after allowing three goals on eight shots in the first period. Sim shut the door in the second and third period, stopping all 11 shots he faced, though Gordon still earned credit for the win. New Brunswick netminder Nicholas Sheehan allowed eight goals on 35 shots through the first two periods, while Pierre-Vincent Guignard stopped all 16 shots he faced in relief in the third. Alberta draws up against Team Ontario in the semi-finals on Thursday night, with a spot in the gold medal game on the line. Game time is 7:30pm at the Centrium in Red Deer. The live stream of the game can be found here. The other semi-final matchup sees Quebec and Saskatchewan go head-to-head. That game goes at 4:00pm at the Centrium, the live stream can be found here. RED DEER - After trailing Team BC most of the game, Team Alberta’s late third period charge propelled them to a 5-4 win on Monday night, securing first place in Pool B in Men’s Hockey at the 2019 Canada Winter Games. Down 4-2 with less than 10 minutes to play in the third period, Alberta mounted a comeback and tied the game in the dying minutes on goals from Marc Lajoie and Zach Ostapchuk. Then, with overtime looming, Captain Sean Tschigerl stunned BC, scoring the game-winner with just 27 seconds left to play, burying a rebound off an excellent individual effort by Matt Savoie. Team BC stormed out to a 3-0 lead with a pair of goals in the first period and one in the second, before Craig Armstrong got Alberta on the board halfway through the second frame, with Colton Dach bringing his team within one heading into the third. But, BC regained a two goal lead just 46 seconds into the final period, setting up Alberta’s comeback. Goaltender Drew Sim earned his first win of the tournament, stopping 27 shots for Alberta, while BC Goalie Thomas Milic made 36 saves. With the first place finish in Pool B, Alberta will play in the Quarterfinals on Wednesday night at the Centrium at 7:30 against the winner of Tuesday night’s game between Newfoundland and New Brunswick. RED DEER - Despite a furious comeback attempt by Manitoba, Team Alberta earned its first win at the Canada Winter Games on Sunday afternoon. Alberta got off to a fast and furious start, scoring five straight goals in the first period, before Manitoba answered back late in the frame. Team Alberta scored another early in the second to take a 6-1 lead, but ran into some penalty trouble, which allowed Manitoba back into the game, and drew within one with just three minutes left to play. Alberta saw goals from six different players: Corson Ceulemans, Colton Dach, Tyson Laventure, Brett Hyland, Kai Uchacz and Craig Armstrong. In his first start of the tournament, Lochlan Gordon made 22 saves to earn the win, while Manitoba netminder Jayden Catellier stopped 27 shots in a losing cause. Team Alberta wraps up round-robin play Monday against BC, and can clinch first place in Pool B with a win. Game time is 7:30pm at the Enmax Centrium. The live broadcast of the came can be found here. RED DEER - Sixteen outstanding young Albertans will hit the ice in Calgary on Saturday for the International Ice Hockey Federation’s Global Girls Hockey Game. In addition to the game itself, athletes will participate in skills clinics, visit the Canadian Sports Hall of Fame, and take in presentations from guest speakers. The Global Girls Game goes at 3pm at the Flames Community Rink. The Global Game embodies the spirit of enjoyment, teamwork, and collaborating with those from diverse backgrounds. This unique game starts on Saturday and will be played in 28 different countries before being handed off to Canada to play the final segment of the game. A cumulative score is kept across all 28 countries between Team White and Team Blue with a winner being declared after the Canadian portion of the game. The goal this game is to unite all females currently playing hockey as one global family. RED DEER - Hockey has been included as an event in the Canada Winter Games since its inaugural year in 1967. Throughout each passing year, the sport has seen its share of different winners and famous alumni. Since its inception, Alberta has been the only province to compete in each iteration of the Canada Winter Games, achieving great results in both the male and female competitions. Male hockey was introduced at the 1967 Canada Winter Games with just three teams participating: Alberta, BC, and Ontario. Team Alberta won the gold medal, followed that up with a silver in 1971, and then gold again in 1975. Each tournament contained three teams. The 1979 Games marked the first year where all provinces and territories entered a team into the tournament. Over the next three Canada Winter Games, Team Alberta finished out of the medals, with 1987 the last Games where Team Alberta Male did not win a medal. Since 1991, Team Alberta has finished with two bronze, three silver, and two gold medals. Alberta is the only province to win a medal in each of the last seven Canada Winter Games events. The 1999 gold medal winning team was a 2018 inductee into the Alberta Hockey Hall of Fame. They were led by notable alumni Jay Bouwmeester and Scott Hartnell. Female hockey was introduced to the Canada Winter Games in 1991. Team Alberta wasted no time finding success, taking home the gold medal with a team that included 13-year-old Hayley Wickenheiser. Since 1991, Team Alberta earned bronze in 1999 and 2015 while taking home the gold for a second time in 2011. The 1991 gold medal winning squad was also inducted into the Alberta Hockey Hall of Fame in 2018. RED DEER - Hockey Alberta is pleased to announce the leadership group for Team Alberta’s U16 Male team for the 2019 Canada Winter Games. Sean Tschigerl (Edmonton) will captain Team Alberta, with defenceman Marc Lajoie (St. Albert) and forwards Dylan Guenther (Edmonton) and Kai Uchacz (De Winton) serving as Assistant Captains. "I’m honoured to be named Captain of Team Alberta, it’s super exciting, and a big opportunity, playing on home soil," said Tschigerl. Team Alberta kicks off play round-robin play against Team Saskatchewan on Saturday at 7:30pm, with games against Manitoba and BC set for Sunday at 4:00pm and 7:30pm, respectively. All games are at the Centrium at Westerner Park. RED DEER – A unique skill development opportunity is available to 2005-born male hockey players in Alberta, as Hockey Alberta and the Western Hockey League are co-hosting the fifth annual WHL Skills Camp. The camp, for U15 players, is set to run June 7-9, 2019 in Calgary at East Calgary Twin Arenas. The cost of the camp is $300. Saturday: Team Alberta/WHL presentation, Yoga, and two skill sessions. Sunday: one skill session, a dry land session and the event will wrap up with a game officiated by the WHL Officials Development Camp. Goaltenders will also participate in an on and off-ice goaltender session. The camp will focus on skill development and proper training techniques, and provides athletes with information about the Team Alberta process, information on the WHL, while challenging players to excel on and off the ice. The maximum capacity for the camp is 168 athletes. Registration is on a first-come, first-served basis. RED DEER - Two outstanding post-secondary students have received Distinguished Leader status from the 2018 Future Leaders Development Program. Brett Ponich and Jake Wozney will each receive a $3,000 scholarship for their work during the Development weekend and Team Alberta Male U16 Summer Camp in Camrose. The Future Leaders Development Program is designed to develop and train post-secondary students in the area of coaching. Areas of focus include proper instruction, administration, leadership, technical and tactical skills in hockey, so that the future leaders can carry those skills into our communities. Scholarship opportunities are made possible by the Hockey Alberta Foundation. Since the Future Leaders Scholarship program was established in 1998, the Hockey Alberta Foundation has invested annually in the development of great leaders for the future of the game and our communities in Alberta. Ponich started his playing career in the Beaumont Minor Hockey Association. He moved on to play Bantam and Midget AAA in Leduc before spending time with the WHL’s Portland Winterhawks, NHL’s St. Louis Blues and Columbus Blue Jackets organizations. Currently, Ponich is a student-athlete for the University of Alberta - Augustana Vikings where he is working on a Bachelor of Science in Physical Education degree, with hopes of entering medical school after his graduation. "The Future Leaders Program allowed me to receive structured coaching instruction that complemented my experience of playing the game," said Ponich. "I was able to not only learn more about the game of hockey, but also how to communicate and work with people better." Wozney grew up in Richmond, BC and began playing with the Seafair Minor Hockey Association. He has been well-travelled, spending time with the Greater Vancouver Canadians, Junior B Richmond Sockeyes, BCHL’s Nanaimo Clippers, AJHL’s Fort McMurray Oil Barons, and SJHL’s Weyburn Red Wings. He is currently playing with the Red Deer College Kings, where he is in his second year of the Kinesiology and Sports Science Program. "It means a lot to me that experienced coaches with Hockey Alberta can see potential in my coaching ability, even with the limited experience that I have," said Wozney. "It gives me motivation to pursue a career in coaching, as well as to continue to grow and add more tools." Registration is now being accepted for the 2019 Future Leaders Development Weekend, taking place in Red Deer, May 3-5. RED DEER - Hockey Alberta’s January Coach of the Month, sponsored by Players Bench Team Apparel, is Ron Laferriere of Wainwright. Ron has coached at various levels in Wainwright for eight years, including as the head coach of the PeeWee AA Polar Kings this season. He also runs a weekly goaltending clinic, where young goalies can receive position specific instruction outside of practice. Ron has been volunteering his time towards this clinic for roughly ten years. "My coaching philosophy includes developing the skills of all the players first, and let winning take care of itself," said Ron. "The best part about coaching is being able to teach life lessons through the game of hockey." "He treats all the players, parents, and opposition with respect and dignity. Ron encourages the players to have success not only on the ice, but also in the classroom and in society… Coach Ron is always giving everything for the players. It is time he is given something in return." Nominations are open throughout the 2018-19 season.